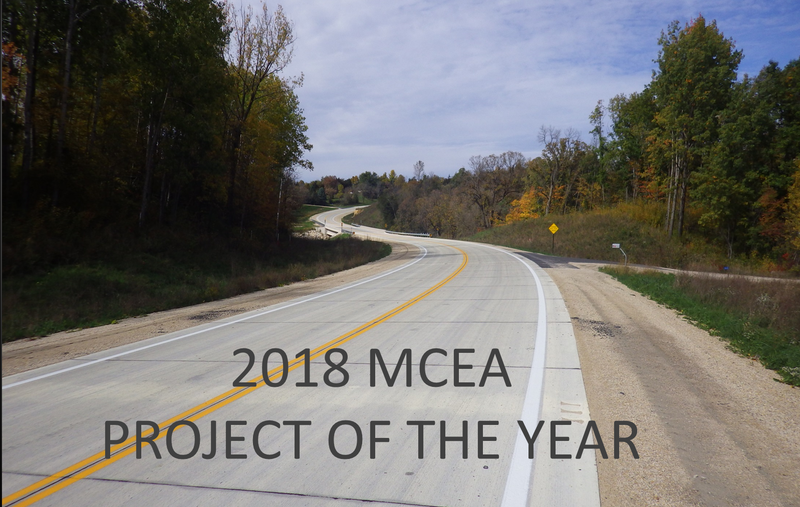 CSAH 1 reconstruction in Fillmore County earned an MCEA award. Highway Safety Achievement Award: Crow Wing, Dakota, Dodge, Freeborn, Itasca, Otter Tail, St. Louis, Stearns, Washington, and Wright Counties. The award recognizes a coalition of county engineers and their participation in St. Louis County's "Local RICWS" project to develop a lower-cost intersection warning system. Project of the Year: Fillmore County CSAH 1 Reconstruction and Surfacing Project, Ron Gregg, county engineer. CSAH 1 is a major commuter route that connects a large portion of Fillmore County to the city of Rochester, and it is the most heavily traveled county road in the county. The 11.2-mile project took three years to complete, involved four contractors, and included the full reconstruction of CSAH 1 and the replacement of three bridges and two concrete box culverts. Planning and construction needed to address several environmental concerns as well as a unique historic site that was adjacent to and through the construction site. Upon completion, the project greatly improved roadway safety for the motorists along this stretch of roadway. The total project cost was $14.8 million. Project of the Year: City of Hopkins — The Artery. Project team: Bolton & Menk, Inc. (project design firm) and Meyer Contracting (project general contractor). The concept of "The Artery” began a decade ago, originally envisioned to increase visibility of the historic downtown Mainstreet and connect the city core to the main vehicular thoroughfare of Excelsior Boulevard. With this vision as a starting point, the City of Hopkins desired a vibrant, interactive, and pedestrian-friendly plan that would draw people from the proposed Southwest Light Rail Transit (SWLRT) downtown Hopkins station through The Artery to Mainstreet. The Artery integrates highly interactive public art, innovative technology, and a two-way cycle track connecting two regional trails. It also incorporates educational elements of storytelling and cultural history all within the public realm, making these three blocks a prime destination along the SWLRT Metro Green Line. Nine Mile Creek Regional Trail — Edina Segment. Managing agency: Three Rivers Park District. honors from CEAM and APWA-MN. Municipal Project of the Year: Interconnect Wastewater Project, City of East Grand Forks. Design Engineer: Widseth Smith Nolting Associates. The cities of East Grand Forks, Minnesota, and Grand Forks, North Dakota, came to an agreement that allowed the City of Grand Forks to provide wastewater treatment for the City of East Grand Forks. The Interconnect Wastewater Project includes a new lift station, 50,000-gallon diurinal basin, 22-acre equalization basin, and approximately 12,000 linear feet of forcemain. The project is a model of two communities’ engagement and close coordination among the engineers, agencies, and communities.